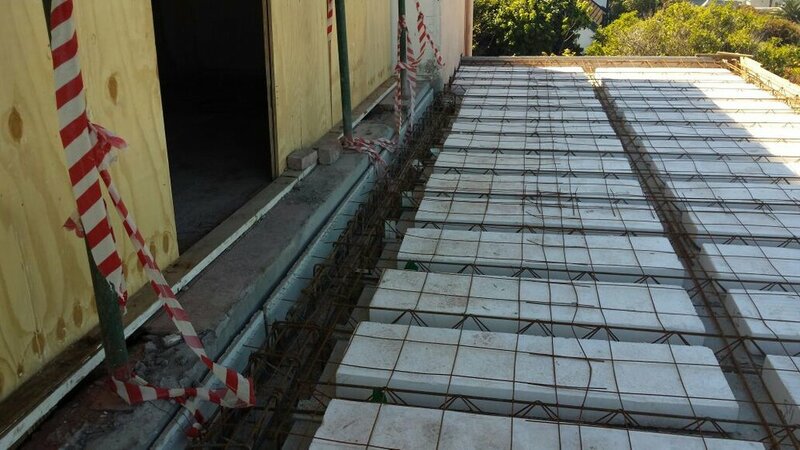 The Cobute precast shutters for beams and suspended slab were supplied for the realisation of a precast balcony in St James, Kalk Bay as well as for a bridge to connect the kitchen to the garage; the structures were designed by Pr.Engineer Ugo Rivera. The Cobute beams consist of two L members; when combined with the slab, the beam half member creates the perimeter, with great ease of installation as shuttering is minimal. The two precast elements allow the creation of a monolithic structure, which can be cast at once, with dramatic time savings. The balcony will offer our clients unparalleled sea views. The precast slab system was also used for the creation of a bridge to connect the kitchen to the garage. Read about more our residential projects here. Chat to us to get a Cobute proposal for the structure of your current project.